Description: I am 30 years old and I am from Norway. On Saturday October 10, 2015 I had an experience that I cannot explain. I was a passenger in a car and on my way home from a course in a location called Asker. I suddenly became aware of a very bright cigar formed object on the sky. Right behind the object a smaller object of the same shape occurred. I was looking at these two objects and I was trying to understand what it was. It was so big, but with no wings and suddenly it disappeared. I was looking around in the sky trying to find it, but the sky was empty. Five Seconds later it suddenly appeared again in the sky, but this time in a new shape and much, much closer to the car I was sitting in. It was V-shaped and upside down if you understand. It was very white and bright but no lights. It was V shaped upside Down and squared like boxes. So I had a 3D sight of it. It was not just a flat thing on the sky, it had mass. (This is in the middle of the day). Behind the biog V it was a smaller V hanging. I was looking at this thing and I was trying to make sense out of it, but I could not understand what it was. My friend who was driving the car did not see it because she was looking at the road. I was planning to tell her to turn her head around to look at it, but I could not make myself tell her to look. I felt paralyzed by the sight and I was to busy in my head trying to find out what this thing was. And then suddenly it disappeared! The sky was empty again. The big, huge thing was just gone. When I came home I started to look up pictures on Google and I found this web page with the Woman and her 21 year old son telling her story that is similar to mine. The shape is the same I guess, but the object I saw was an upside down V. And I did see a cigar shaped object first and then it suddenly became V shaped after disappearing and reapparing again. I am just looking for answers. Do you have more information about others seeing stuff like this V shaped thing that I did see this weekend? I have never seen anything like this. The thing was just hanging in the sky. I am just confused. I will be happy if you got more stories like this. PS: I also attached a drawing on what I did see. Ha ha it is not the best drawing, but this is the best I can do. 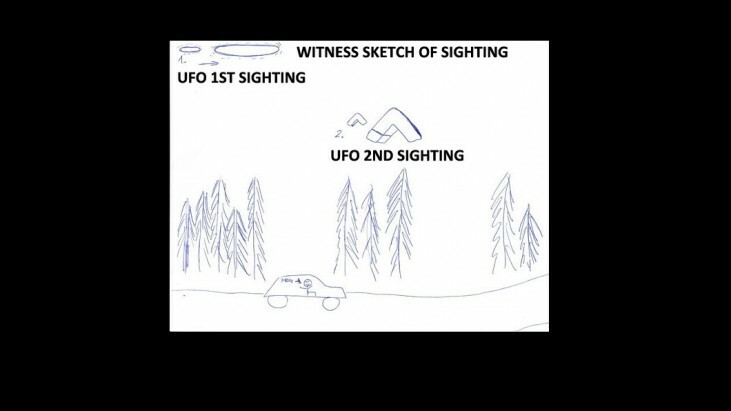 Number 1. is how I did saw the objects the first time, and number 2. is how I saw the Objects the second time it occurred in the sky.